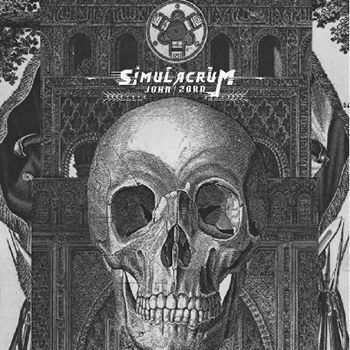 Simulacrum is for those who were afraid John Zorn might be getting soft. New York-based avant-garde composer John Zorn sometimes works at extremes. Whether it's something he does intentionally or accidentally, his fans have nonetheless grown accustomed to his ever-shifting musical personality. Between 2012 and 2014, Zorn composed many pretty pieces for his Gnostic Trio of Bill Frisell on guitar, Carol Emanuel on harp, and Kenny Wollesen on vibraphone and bells. Then he goes and forms an organ trio to perform some of his heaviest, most ruthless music since Mike Patton wailed away for Moonchild. Simulacrum features six compositions performed by Matt Hollenberg on guitar, Kenny Grohowski on drums, and the acclaimed John Medeski on the organ. The album plays around with several styles and can conjure up a three-dimensional mood when it needs to, but the prevailing winds blow it into seas of heavy metal... with an organ. Hollenberg plays with Cleric. Medeski plays with, of course, Medeski, Martin & Wood. So leave it to a guy like Zorn to pit these two together as a basis for his new project. Calling Simulacrum crunchy, thick, and stabby is accurate but such metallic adjectives only give you part of the picture. The 12-minute opener "The Illusionist" plays out like several ideas rolled into one track, all with the unmistakable stamp of Zorn. First it takes off with a minor-key cyclical pattern set to a shifting meter. Just as Medeski commences to pull the sound into a stuffy, aged theatre, he unisons up with Hollenberg in a truly prog moment (think Howe and Wakeman playing a complicated pattern together, perfectly). From there on, all bets are off as to what kind of music this truly is. One moment, Medeski has taken us to the fairgrounds. Then next moment, Hollenberg has tossed us into the mosh pit. Then he turns off his distortion and plays something surprisingly close to a Gnostic Trio-esque Frisellian lick. After several minutes of rocking out, "The Illusionist" almost collapses in a heap of near-confusion. And that's just the first song. The shorter songs are more unified by comparison. "Marmarath" may be riff happy for more than five minutes, but it's a bedrock for Medeski's extended improvisations. "Snakes and Ladders" is a trio's chance to get spooky and atmospheric, vamping over a motif than could be considered minimal jazz. That is, until Hollenberg's distortion pedal gets ahold of the track. Medeski uses these moments to plunge deep into Dracula's castle, with Hollenberg's blazing guitar and Grohowski's pounding syncopation as his guiding torchlight. "Alterities", Simulacrum's shortest song, is all experiments and no riffs. The even-thicker slabs of distortion on "Paradigm Shift" more than make up for "Alterities"'s amorphous nature. The final track, "The Divine Comedy", uses its length to mirror the intentions set forth by "The Illusionist". The boundaries between metal, noise-rock, and avant-garde jazz become close to being non-existent. "The Divine Comedy" also shows this trio at their dynamic extremes, playing so quietly together at the 5:28 mark that you forget that this is one of John Zorn's heavier projects. But at almost 13 minutes in length, there's plenty of chances left for "The Divine Comedy" to explode again. And explode it does. We all know that we can't pigeonhole John Zorn. Often, the best we can do is call him avant-garde. Instead we parcel out labels to his various projects. Various ones are light and melodic, others are atonal and heavy, sometimes they are light yet atonal, and so on. Simulacrum shows that we're bound to mislabel something of Zorn's even within the confines of one recording. And if that isn't some form of creativity, then I guess I don't know what is.